This is the first of a three-part series about Caetano Veloso’s and Gilberto Gil’s years in exile. Part 1 looks at why Caetano and Gil were forced into exile. In Part 2, the musicians arrive in Europe, move to London and spend their first year living in Chelsea, while in Part 3 they move to Notting Hill before eventually returning to Brazil. 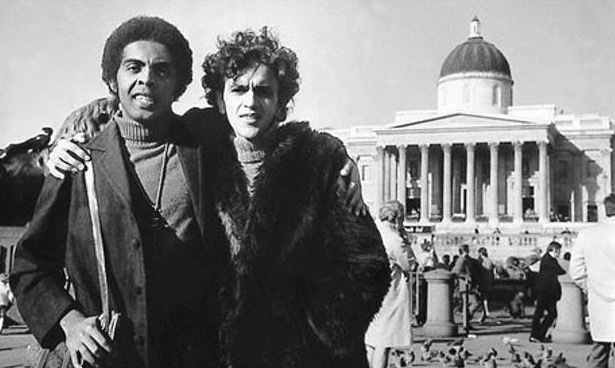 Gil and Caetano in Trafalgar Square, 1969. 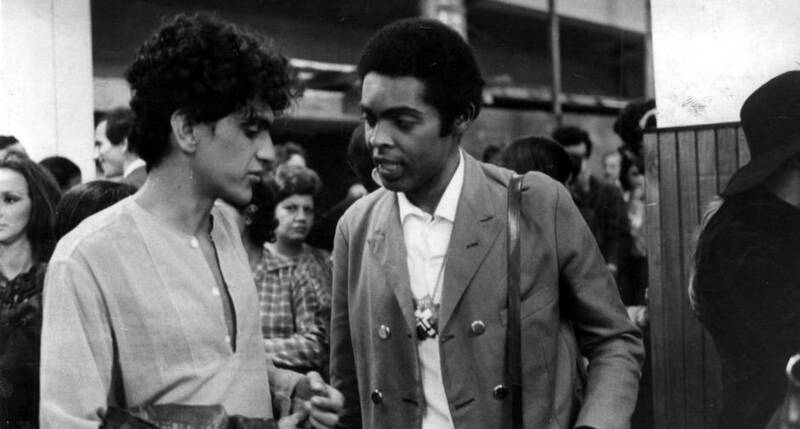 In 1969 the young singer-song writers Caetano Veloso and Gilberto Gil arrived in London, expelled from military-ruled Brazil. Caetano and Gil had emerged as central figures behind culturally subversive tropicália, a movement that encompassed music, poetry, theatre and film. The musicians experimented by fusing traditional Brazilian popular styles with foreign pop and the Brazilian avant-garde. In this, they were inspired by the “Movimento Antropofagia”, whose theories of cultural cannibalism were developed in the 1920s by the São Paulo poet Oswaldo de Andrade. By the time Gil and Caetano arrived in Europe, both men were well on track to become superstars of Brazilian popular music. Gil and Caetano met in 1963 at university in Salvador, the capital Bahia, in Brazil’s culturally vibrant Northeast. There they collaborated, initially performing traditional Northeastern songs and bossa nova melodies, sometimes together with Maria Bethânia (Caetano’s sister), Gal Costa and Tom Zé, other future stars. In 1965 they left Salvador to pursue opportunities in the cultural hubs to the south, with Gil moving to São Paulo and Caetano (with Bethânia) opting for Rio de Janeiro. They soon came to the attention of a wider Brazilian public, in no small part thanks to the growing reach of television. Competitive music festivals were hugely popular televised events in Brazil between 1965 and 1971. Gil and Caetano both competed in 1967, and although they participated somewhat reluctantly, their entries were serious ones. Gil (accompanied by the rock band Os Mutantes) took second place with “Domingo no parque” [“Sunday in the park”], a song concerning a crime of passion on a ferris wheel ride. Caetano (accompanied by the Beat Boys, a group of young Argentines who were clearly influenced by the likes of the Beatles) came in fourth place with “Alegria, Alegria” [“Joy, Joy”], a song embracing images drawn from contemporary pop culture and including metaphors denouncing the violence of the military regime and social inequalities. Both performances were controversial, criticised by nationalists from both the left and the right, not least for using the electric guitar and keyboard. These instruments were considered by many as symbols of cultural imperialism and Gil and Caetano were not ashamed by their attraction to Anglo-American rock and pop of the ’60s, revelling in the music of the likes of the Beatles, Jimi Hendrix and Bob Dylan. In September 1968 Caetano and Gil entered another song competition. This time they made no attempt to win over the judges or the largely middle class and student audience – instead they deliberately set out to disturb. In this they were successful, though the audience’s response was more anger and bewilderment than, as intended, to question the limits of contemporary popular culture. Gil – again with the Beat Boys – performed “Questão da ordem” [“Question of order”], an entry that was disqualified on the grounds that it supposedly deviated from the norms of popular Brazilian music. The anarchic lyrics included allusions critical of the “order” that both the military and the left sought to impose on society. The performance provoked to hurl a barrage of projectiles towards the stage. This is the youth that says it wants to take power? You’re the same youth that will always, always kill the old enemy who died yesterday. You understand nothing, nothing, absolutely nothing! […] Today I came here to say that Gilberto Gil and I had the courage to confront the structure of the festival and explode it. […] We only entered the festival for this reason. […] We, him and I, had the courage to enter all of the structures and leave them. And you? If you are the same in politics as you are in aesthetics we’re done for! Needless to say, neither Gil nor Caetano won many friends in the hall that evening, nor came anywhere close to winning the competition. Instead, first place went to Tom Jobim’s and Chico Buarque’s schmaltzy (though some would say “haunting”), song “Sabiá” [“Thrush”]. The audiences’ favourite was controversially placed in second place: Geraldo Valdré’s beautiful, overtly anti-military, song “Pra não dizer que não falei das flores” [“So it can’t be said that I didn’t speak of flowers”] would later be adopted as an anthem of Brazil’s movement against the military dictatorship. 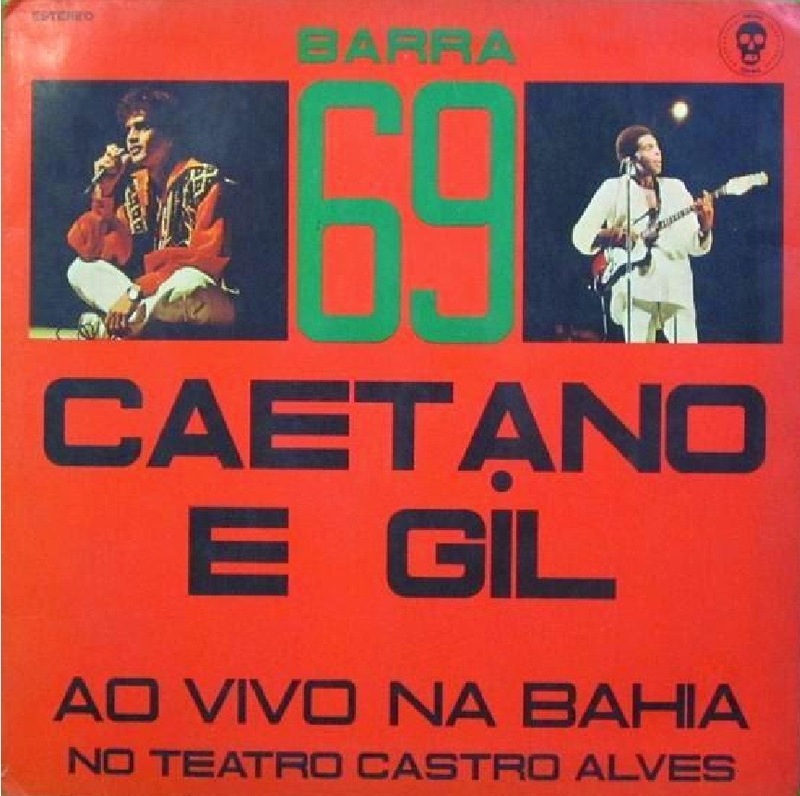 The musical ascendency of Gil and Caetano coincided with the seizure of political power by the Brazilian armed forces. In 1964 a coup was staged, with the army overthrowing João Goulart, the country’s leftist president. Over the following years the military regime asserted itself, introducing a range of measures suppressing opposition. On 13th December 1968 the dictatorship issued a decree (AI-5) closing down the National Congress and most state assemblies and requiring political meetings to be authorised by the police. Measures were put in place to censor, on the grounds of subverting the nation’s “political moral values”, the press, television, radio, theatre, film and music. Haebeas corpus was suspended for politically motivated “crimes”. In the following months and years, critics of the military were rounded up, imprisoned without trial and routinely tortured. Hélio Oiticica: “be an outlaw, be a hero”. In contrast to the repression of artists and intellectuals a few years later in Chile, Uruguay and Argentina, the situation in Brazil was not quite as bleak. By keeping a low profile, it was often possible to remain in Brazil unmolested by the military – but the threat of being picked up by agents of the state hung over anyone who might be perceived as being hostile to the government. Despite the repressive atmosphere, Caetano would later say that both he and Gil were surprised when they were arrested in São Paulo, exactly two weeks after the proclamation of AI-5. Neither Gil nor Caetano were overtly political but instead they were targeted for their anti-nationalist and satirical cultural positions and were considered a “degenerate” influence on Brazilian youth. 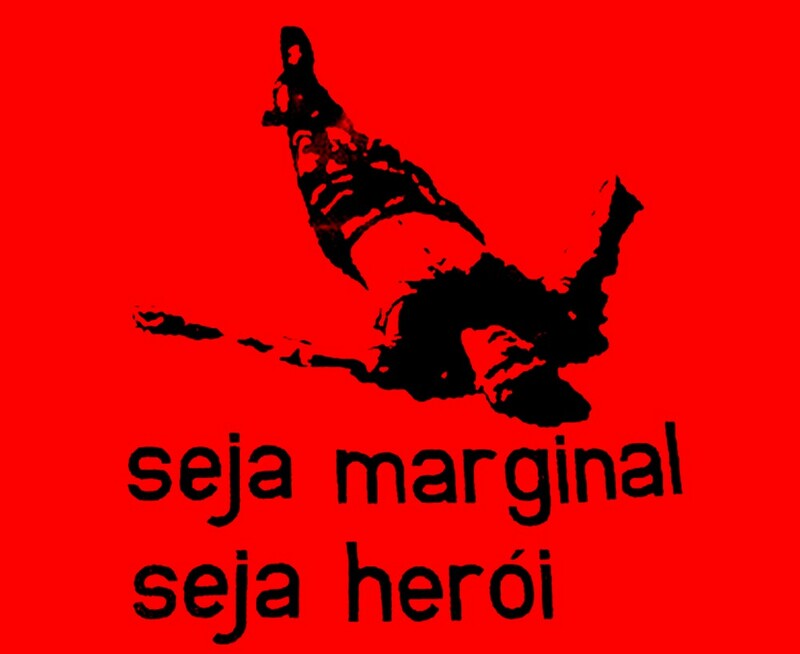 The spark that led to their arrest was an accusation that during a concert they sang the national anthem “in an obscene manner”, against the backdrop of an image by the artist Hélio Oiticica of a criminal executed by the police and the slogan “seja marginal, seja herói” [“be an outlaw, be a hero”]. Brazil, love it or leave it: “the triumphant slogan of the dictatorship” (Caetano). Soon after their arrests, Caetano and Gil were transferred to Rio where they were moved between military detention centres. They were often held in solitary confinement, were constantly intimidated and, in a symbolic act of humiliation, both had their famously long hair shorn off. (One of Caetano’s favourite songs, “Terra“ [“Earth”] was born in his prison cell and produced while in exile: he was given a copy of the magazine Manchete which included, for the first time, photos of Earth from outer space). Finally, on February 19th, they were put on an air force plane and flown north to Salvador. There they remained under semi-house arrest, until they were “invited” to leave the country. As neither Caetano nor Gil had the money for the airfares, let alone resources to meet expenses abroad, a solution had to be found. Despite being banned from making public appearances, the two persuaded the authorities to grant them permission to perform in Salvador, on condition that they pledged not to “incite” the crowd. The shows (they were allowed two) went ahead on the 20th and 21st July 1969 at the Teatro Castro Alves, the largest artistic venue in the city. Caetano, aged 26, and Gil, who had just turned 27, were then escorted to Rio to await their travel documents. A few days later, together with their wives – sisters Dedé and Sandra Gadelha – they boarded a plane for Europe. Caetano and Gil embarking for exile in Europe, July 1969. See Part 2 – Caetano and Gil arrive in Europe, move to London and rent a house in Chelsea. See Part 3 on life in Notting Hill and the return to Brazil. Please visit the home page to follow The World Elsewhere and also “like” on Facebook! !